By default, the Windows Installer service does not start while in Safe Mode. This service allows you to not only install, but to uninstall software. It also does not allow you to start the service in Safe Mode. 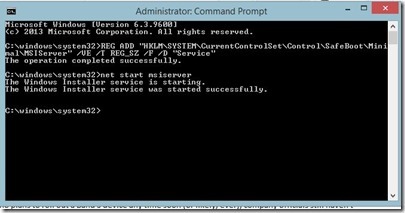 Here is how to create and start the service in Safe Mode. 2. Type REG ADD “HKLM\SYSTEM\CurrentControlSet\Control\SafeBoot\Minimal\MSIServer” /VE /T REG_SZ /F /D “Service” and press enter. 2a. If you are in Safe Mode with Networking, you would type REG ADD “HKLM\SYSTEM\CurrentControlSet\Control\SafeBoot\Network\MSIServer” /VE /T REG_SZ /F /D “Service” and press enter. 3. 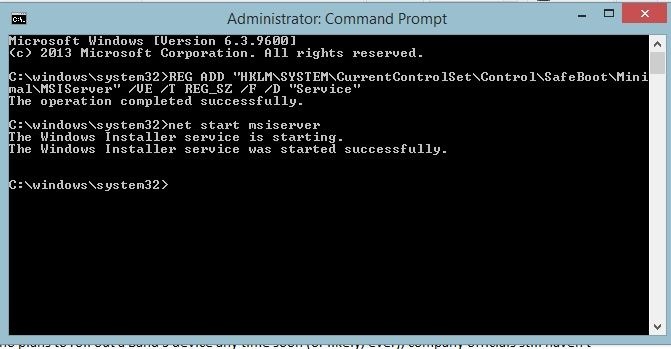 Type net start msiserver and press enter. Now you should be able to install or uninstall software while in Safe Mode. This comes in handy when a piece of software causes issues after being installed. Omg. Thank you so much.